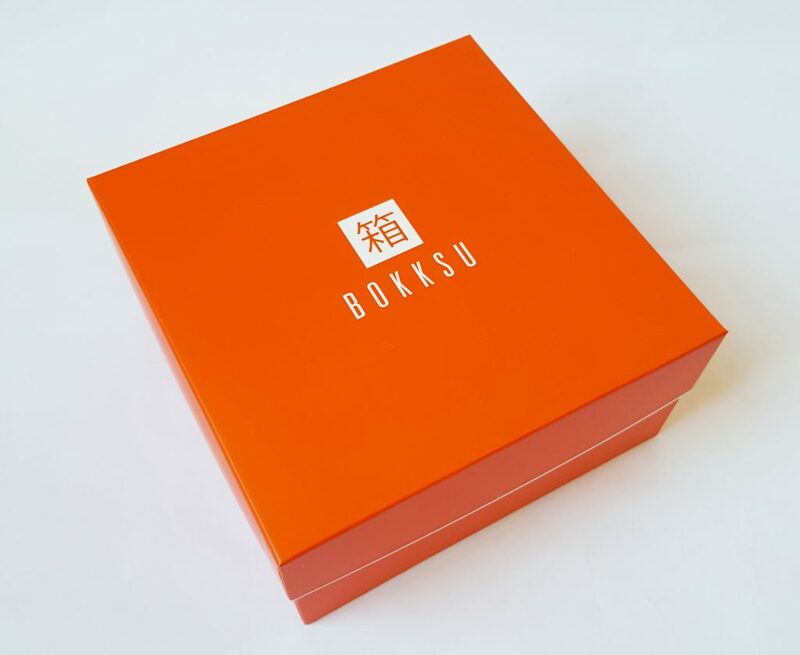 Everything is presented in a beautiful box, which is shipped in another cardboard box for protection. 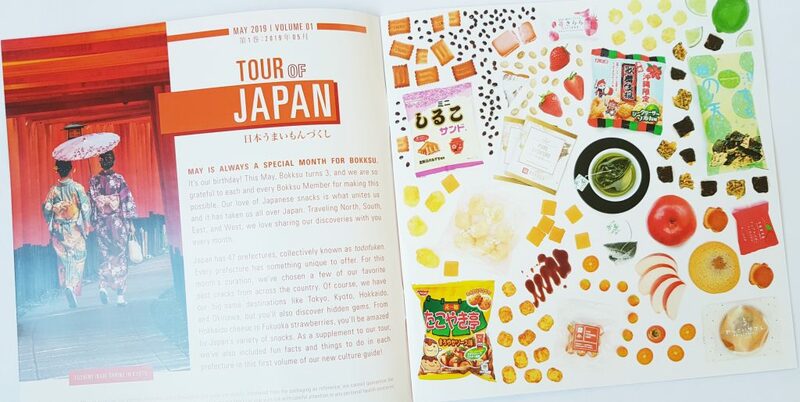 May is Bokksu’s anniversary, so this month we are taken on a Tour of Japan, with snacks from all over the country. 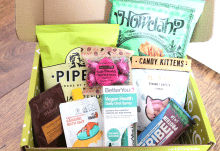 There’s also an extra little treat for regular subscribers! 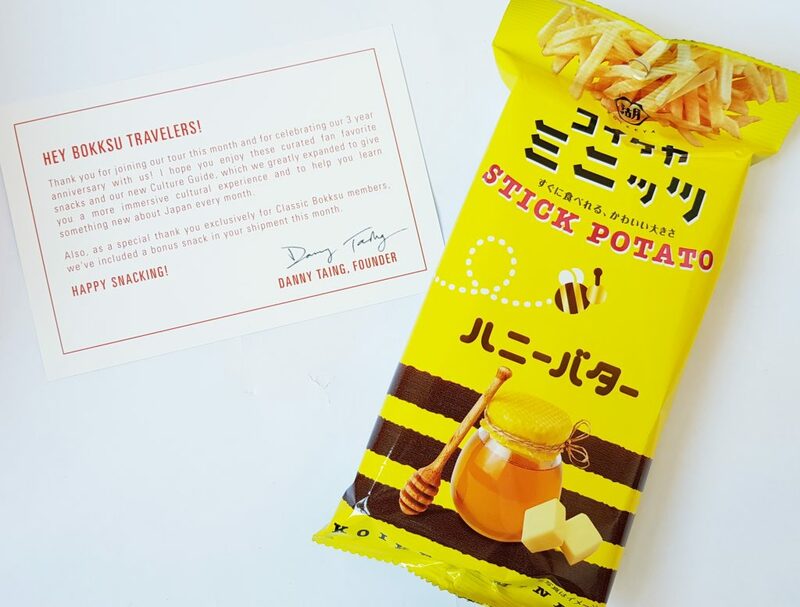 These Honey Butter Stick Potato are delicious crunchy potato sticks with a lovely sweet-salty honey butter flavour. The usual foldout menu card has been swapped for a booklet. I don’t know if this is going to be a regular change, or if it’s just for this month, but it’s really terrific. You’ve got a little map that shows you the region each item is from. There’s a list of all the items, with lots of details, including allergens. 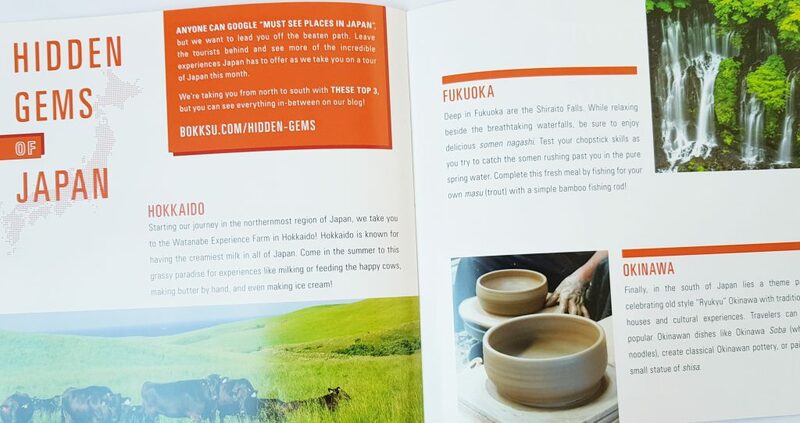 There’s even some extra information about visiting Japan! 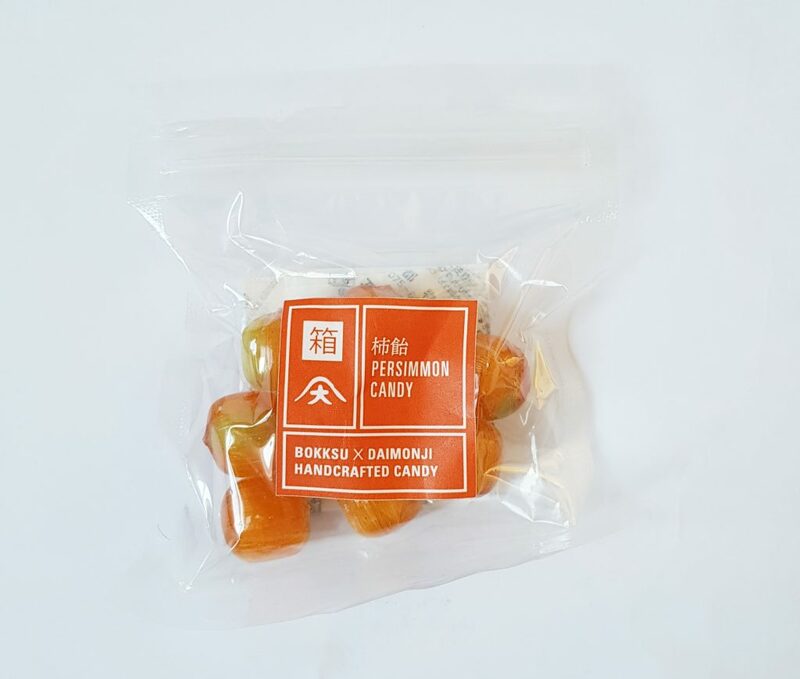 Bokksu started having candy specially made last year, and this Persimmon Candy is one of the most interesting varieties. Persimmon is a beloved seasonal fruit in Japan, with a very unique flavour. This is a kind of candy you’re unlikely to find anywhere else. Apple Butter Financier is a Japanese take on a traditional French cake. This version is make with Japanese apple butter, and is deliciously moist and soft. It’s even shaped like an apple! 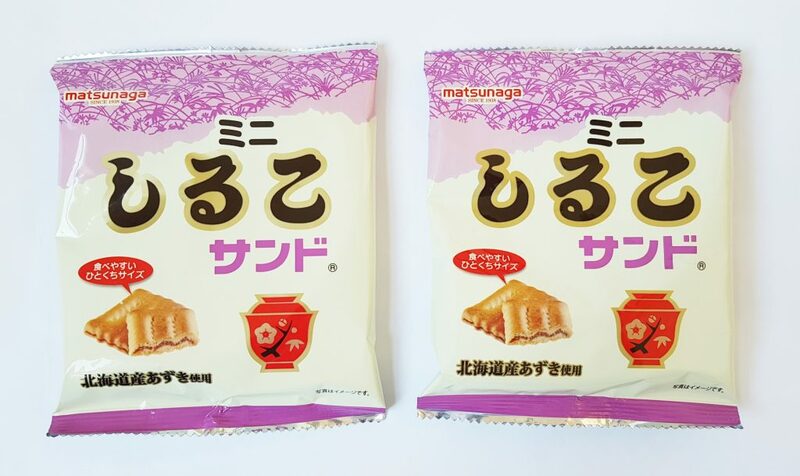 Sweet Red Bean is a traditional Japanese ingredient, and these Mini Red Bean Crackers are a golden cracker with a layer of sweet red bean paste sandwiched inside. 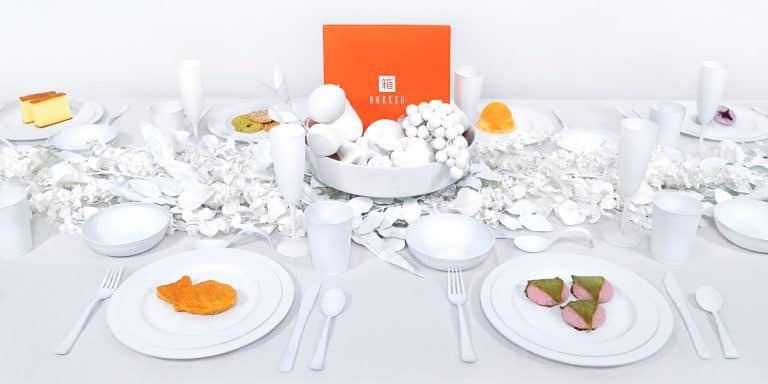 This cracker is inspired by the taste of red bean porridge, which is a dessert traditionally eaten in the wintertime. Black Sesame Kinako Chocolate Azuki Beans also use the red bean, but this time they are simmered in syrup and then coated in white chocolate. 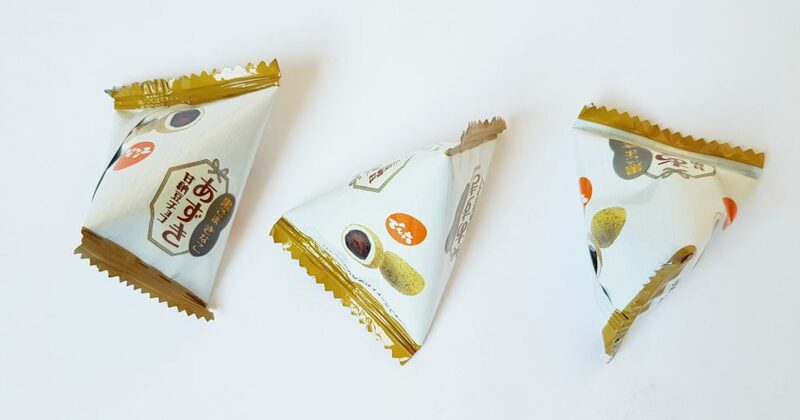 They are then coated with kinako powder, which is roasted soybean, and has a wonderful rich slightly nutty flavour, which is a great contrast to the sweet bean and chocolate. These are one of my favourite cookie! 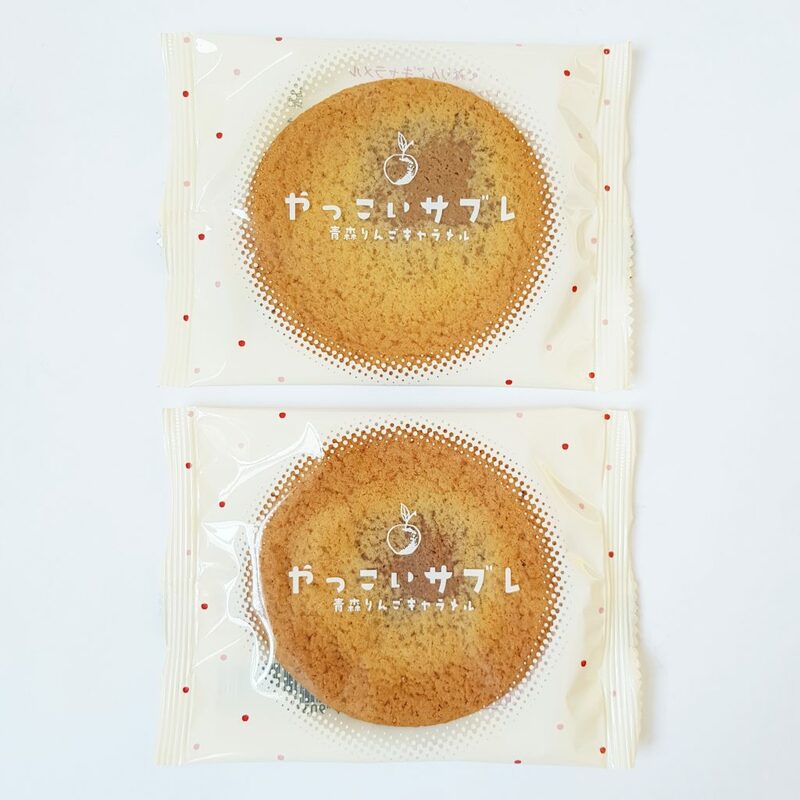 Apple Caramel Yakkoi Sable are deliciously sweet and chewy, and contain rich apple-caramel butter. A really tasty treat, especially with a cup of tea! 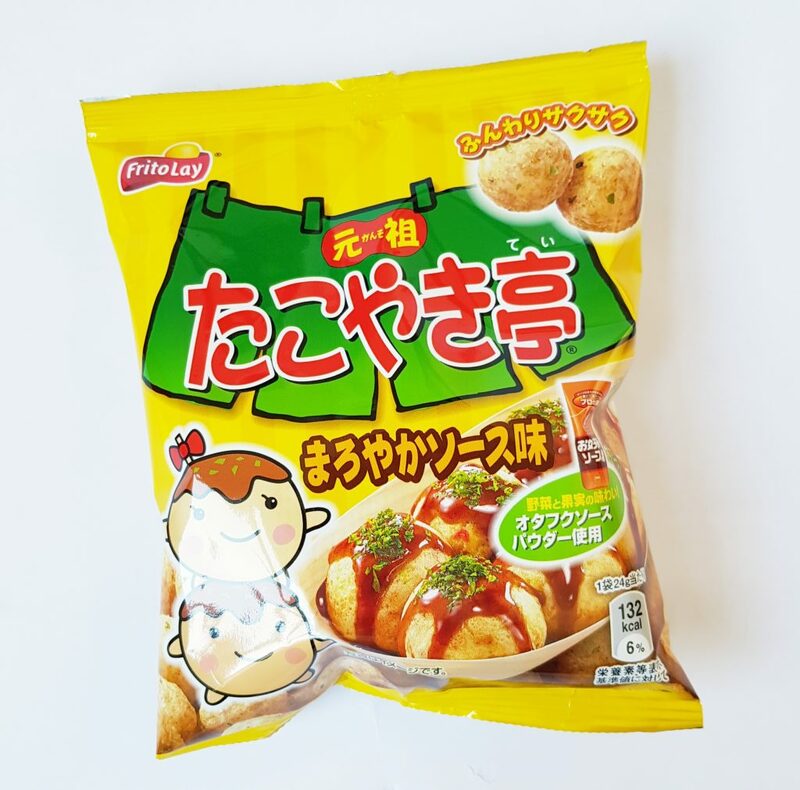 Takoyaki Corn Puffs are light crunchy corn puffs with the flavour of takoyaki. This is fried octopus balls, and it a very popular street food from Osaka. More puffs, but these are Hokkaido Cheese Mochi Puffs. 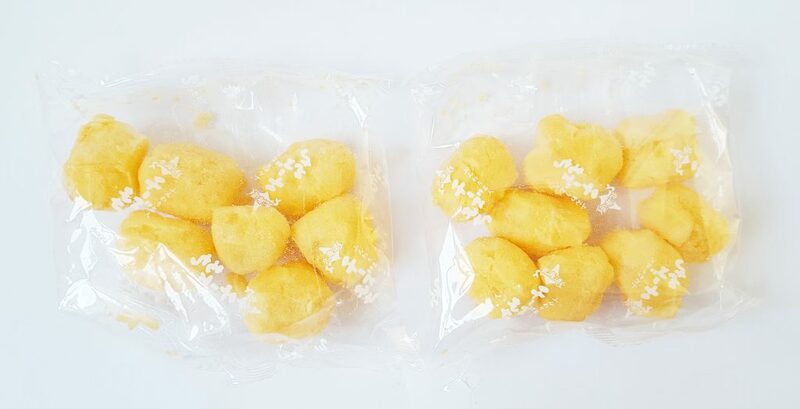 A special kind of incredibly light mochi (rice cake) these melting bites are coated with Hokkaido cheese powder for a deeply savory taste. Seaweed Tempura with Sudachi are from Hiroshima. They are battered and fried seaweed sheets which are seasoned with sudachi, a citrus fruit native to Japan. 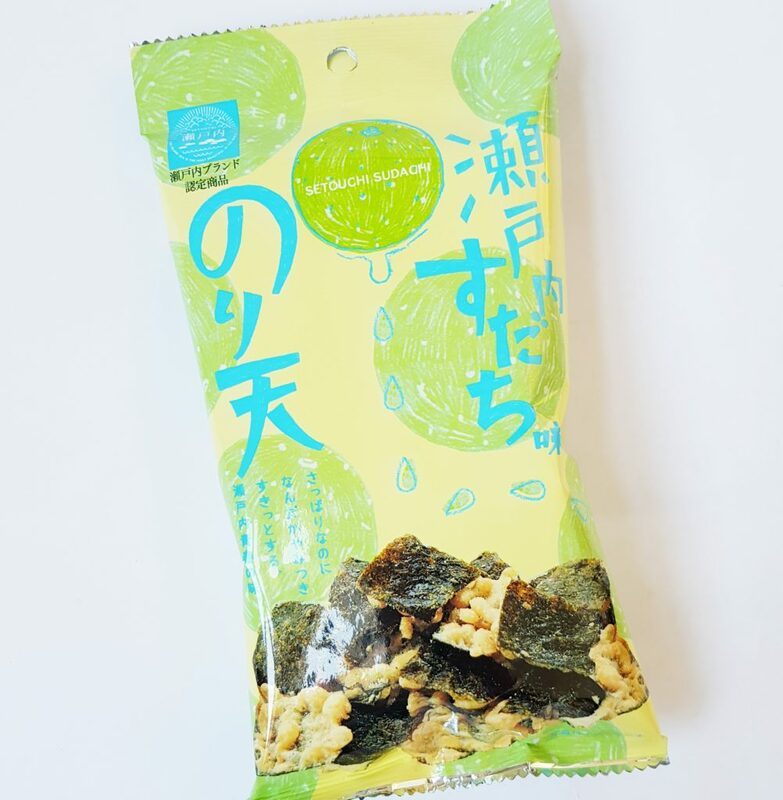 Another Japanese fruit is featured in this snack, Kabukiage Rice Crackers Shiquasa Salt. 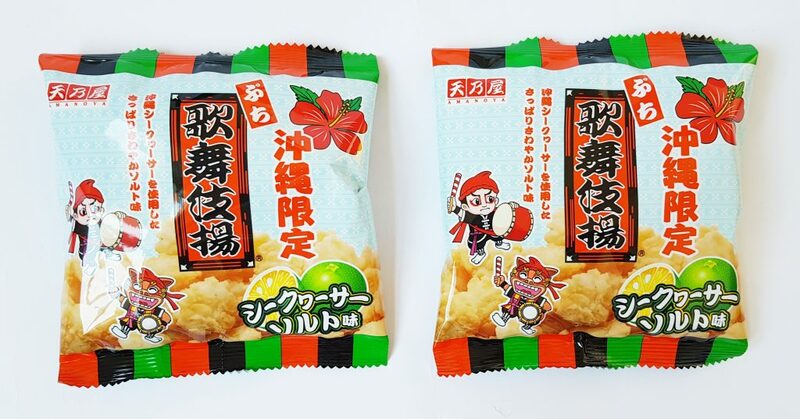 These light crispy rice crackers are flavoured with soy sauce and shiquasa, also known and ‘flat lemon’. The salt and citrus flavours are a wonderful tangy and savory combination. Returning to fruity flavours, this is Strawberry Kirara. This cookie consists of two crisp strawberry cookies with a layer of rich strawberry cream with crispy flakes and freeze dried strawberries sandwiched between them. 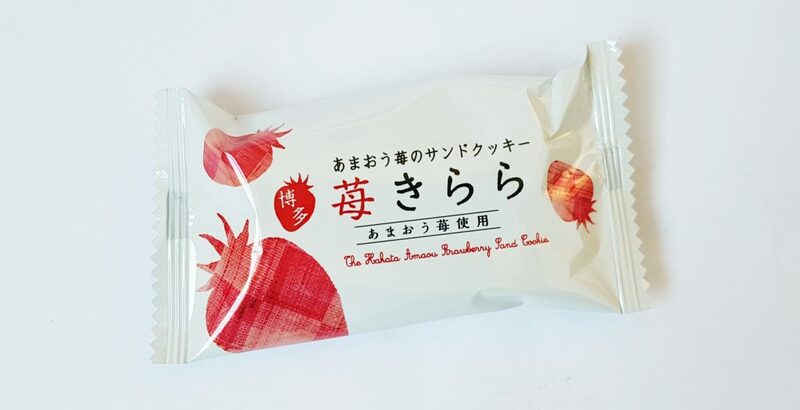 The strawberries are the Amaou variety, which are highly sought after in Japan. Intensely flavoured and very tasty! Finally, this month’s tea is Pure Gyokuro, which is the highest grade green tea available. 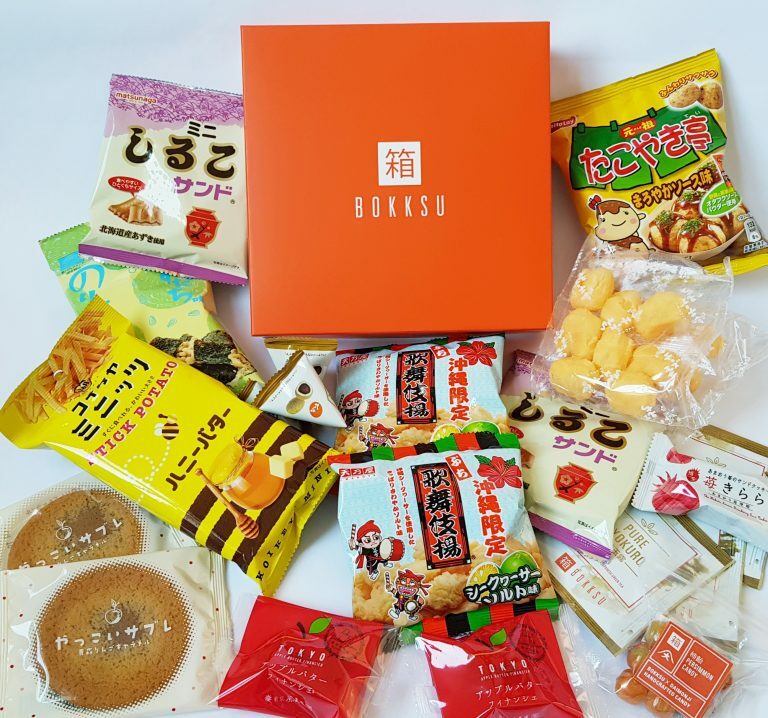 This one is specially selected and packaged for Bokksu! I think this is a fascinating selection. Even though there are a couple I can’t eat (contain seafood and I’m allergic) it’s so fun to see such a wide variety, as well as items from a previous box. The Hokkaido Mochi Puffs are amazing, though I have to say that Bokksu have previously featured these coated with kinako powder, which is utterly sublime. I like the cheese ones very much, but I hope to see the kinako variety back. My particular favourites are the apple financier and the chewy apple cookies. I love fruit snacks, especially apple pastries, and these are both yummy, I just wish there had been more of them! 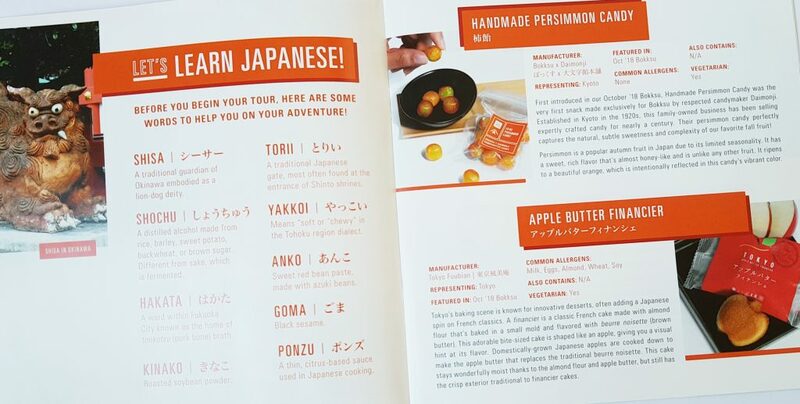 The new booklet is terrific, I love all the extra information you get on each snack, and it’s easier to manage then the previous folded menu, so I hope they keep to this new format. 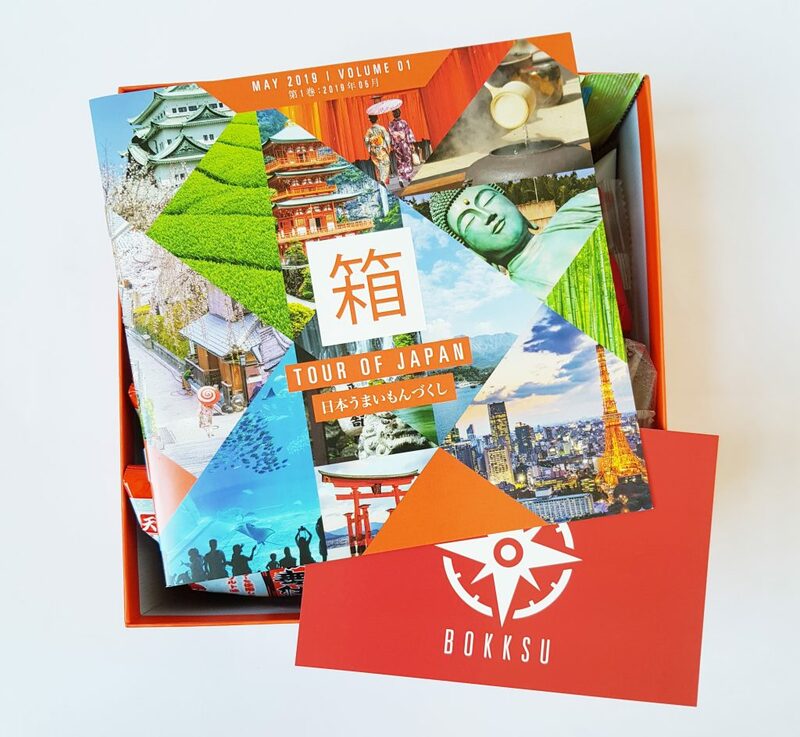 A wonderful journey around Japan, taking in a multitude of flavours and textures. 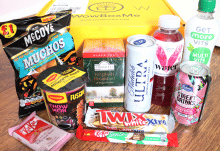 A huge treat for any foodie!